This will be your last week of deliveries, if you have a half share and pick up on the odd-numbered weeks, and you do not have an extended season share. Thank you for being with us this season. We’re quite pleased with the season and we hope you are, also. In Farm News this week, Farmer John Writes Why Be a Shareholder? It’s illuminating to read what shareholders write us about their CSA experience. For some, the experience is completely about the box and its contents, about its value compared to what could be purchased at a store. Is the box full enough? Fresh enough? Impeccable enough? Of course, we strive to provide great value through the box. Our vegetables and herbs are surely less expensive than their organic equivalents at Whole Foods…and fresher…and more local. At the other end of the spectrum, shareholders write poetically about their relationship to the food and to the farm. These acknowledgments bring us joy. We don’t want the shareholder experience to be just about the food; we want it to be about the relationship the food builds to the being or the organism of the farm–to the farm team, the soil, the weather, the seasons. Having a relationship to the farm that grows ones food brings the shareholder consciously closer to the source of physical sustenance, to the earth. A store or an organic delivery service cannot provide this deep, conscious relationship to the land. Eating from a particular farm week after week provides a direct unfolding experience of sun, wind, rain, drought, soil, and work that converge to bring the food to your table. Without having to buy your own farm, you and your family still have the experience of having a farm. 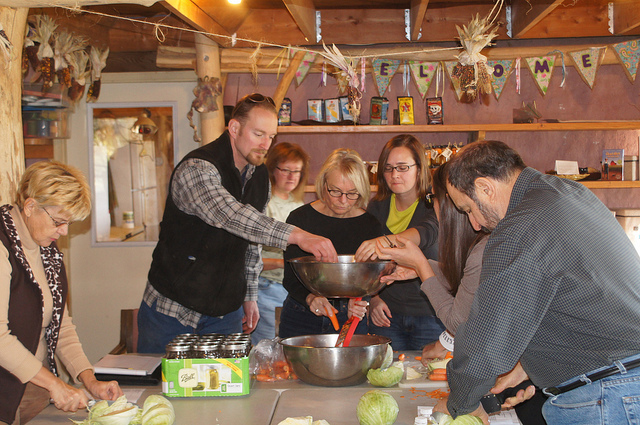 You have this experience through our newsletters, our open houses, and eating from our fields. You become more conscious and more embedded citizens of our planet. Thank you Angelic Organics for your positive influence on my kids! My son just loves all the veggies, especially the carrots with the tops still on! It was a beautiful day to pick beans and flowers at the U-Pick at Angelic Organics! Nothing makes me happier than my kids begging me to cut open the honeydew for their snack! It was absolutely delicious. 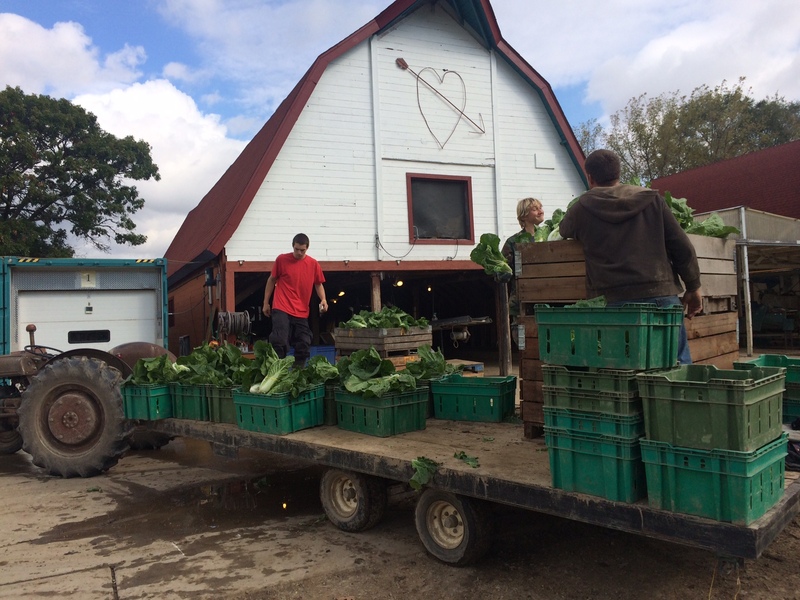 Thanks so much for all your hard work to bring us fabulous, organic fruits and vegetables!! 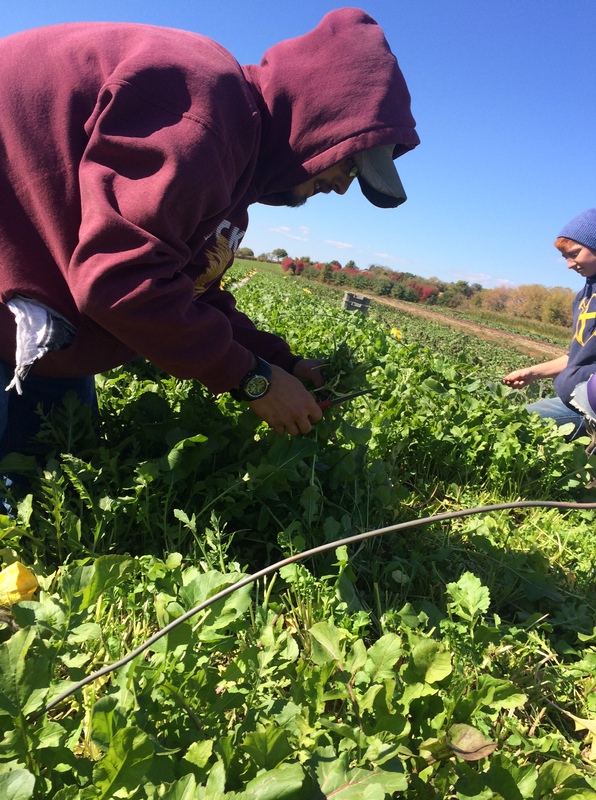 We completed the potato harvest on Friday, and the popcorn and beet harvests on Saturday. We still have a lot of-frost hardy lettuce in the fields…also, baby greens, daikon radishes, rutabaga, sage, cabbage, broccoli shoots, and Brussels sprouts. 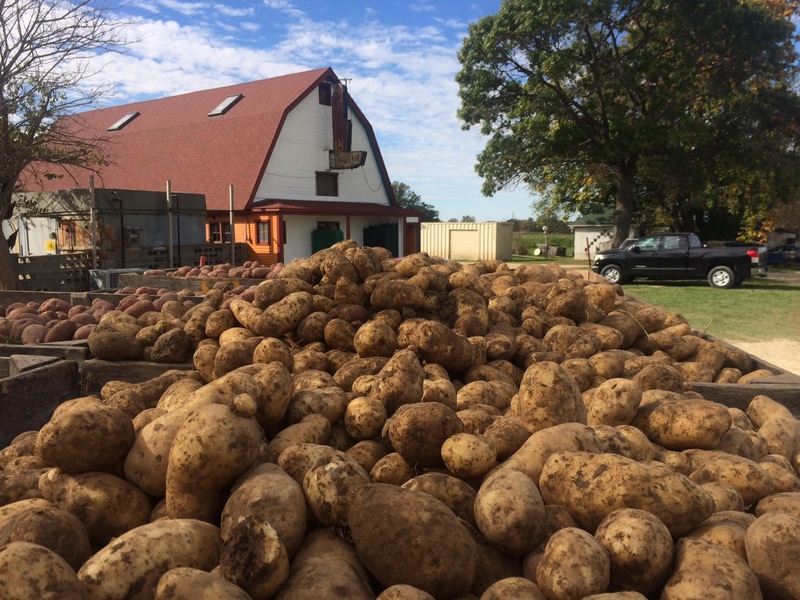 And we have lots of potatoes and squash and some lovely onions in storage to be distributed in your boxes in the upcoming weeks. The days are getting shorter. Some of our crew has been starting at 6 a.m., but now it’s dark at 6, so they start at 6:30. Soon they’ll be starting at 7, as night envelopes more of our day. The work has been especially orderly the past couple of weeks, because the weather has been so mild—no storms or heavy winds working against us. 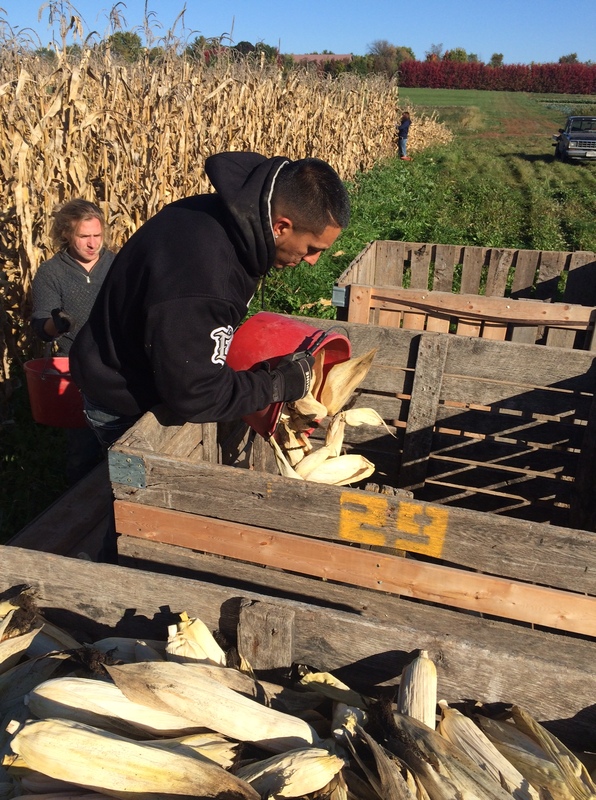 On Saturday morning, the Casiques began separating garlic bulbs into cloves for our upcoming planting of next year’s garlic crop, while Primo was working up the field where the garlic will be planted this fall. 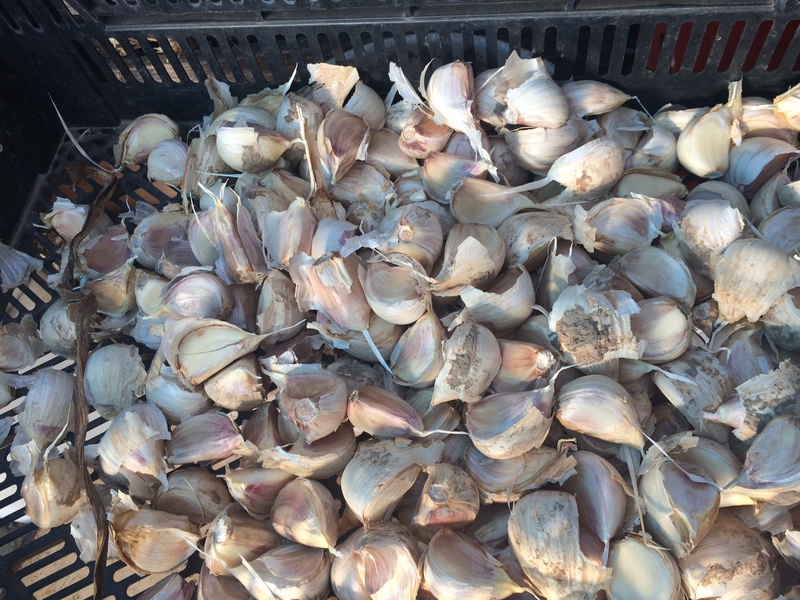 We’re increasing the garlic acreage for next year, since so many of our shareholders love garlic, and seem to especially love our German White Porcelain Garlic. Even though we are very busy harvesting and packing boxes, we are turning our attention to 2015 while 2014 is fresh in our minds. We’re meeting on variety selection, crop composition, timing of plantings…there are dozens of things to consider to make our next season the best possible. Arugula will perish quickly if stored wet in a plastic bag, if it appears moist, please do the following before storing it in the refrigerator: Fill a large bowl or dishpan with cold water. Add greens and swirl around vigorously. All the dirt and sand will sink to the bottom. Lift greens out of basin and into a salad spinner or colander. Spin greens to dry or drain as best you can and dry on towels. If you don’t have a spinner or colander, soak up the moisture with paper towels. Store washed and spun greens in a Ziploc bag or plastic container lined with a dry paper towel in the refrigerator. Cut greens perish more quickly if stored wet in a plastic bag. Consume the arugula within a few days of receiving it. Plus, we have a special offer going on now: 10% off any and all fall classes! Use the discount code “FALL201410AOSHAREHOLDER.” Expires on December 1, 2014.